Lessons from £30 per hour. Jim Colvin Driving Tuition is based in Exmouth and provides driving lessons in Exmouth, Budleigh Salterton, Lympstone, Exton, Topsham and Exeter. Taking your driving lessons with me will help you pass your test quickly and easily with a structured course tailored to your needs and requirements. You will benefit from a method of learning to drive which will help you to become a safe, considerate and confident driver in as short a time as possible. You will find your time with me to be challenging yet supportive and fun, moving along at a pace that you feel happy with. Call or Text 07815 592999 or 01395 225304 now for details of how I can help you to pass your test and become truly independent! 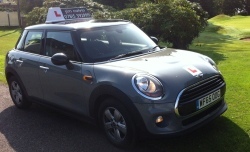 3 hour introduction to driving at Devon Drivers Centre Academy Road Circuit £90. Bring a friend and share the cost. Great Christmas or Birthday Present. Free home visit is available for your convenience. Help and advice with your theory test. Free flexible pick up and drop off in and around Exmouth. Lesson length: normally 2 hours. Dedicated one-to-one tuition, same instructor every time. Excellent value for the professional service provided. Dual controlled, air conditioned car for your safety and comfort. The perfect gift, ideal for: Christmas - Birthdays - Exam Results. Can be purchased to any value for your convenience. Gift vouchers - the ideal Birthday present for those hard to buy for teenagers. Call or Text 07815 592999 or 01395 225304 now for further details. When you choose Jim Colvin Driving Tuition you'll not only be well on the road to passing your test, but you'll become a confident, responsible and economic driver, saving you £££s over the course of your driving career. I will take you further, to new and different places, gaining as much experience as possible before you take your test. When test day comes around you'll be ready for anything and confident that you have all the necessary skills and experience. Jim Colvin Driving Tuition goes further and puts you first - Call or Text now on 07815 592999 or 01395 225304 for my latest offers and start on the road to success.